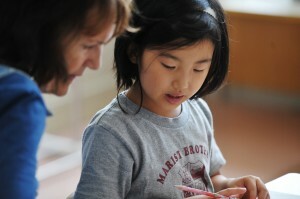 The ELL Department at Marist Brothers International School serves a wide range of English Language Learners (ELLs) through a combination of pull-out, sheltered, and academic support programs. Our belief is that language learning is a process that each student masters at his or her own pace. The goal of the department is to develop the ELL’s social and academic language skills through Language Arts and content focused courses in a small class environment. ELL students in Grades 1 through 6 go to the ELL classrooms during their grade level Language Arts block. The small class environment of the ELL classroom provides the students with ample opportunity to practice speaking and listening. The reading program utilizes a combination of the Moving Into English ELL Reading Anthologies, the Houghton-Mifflin grade level Reading Anthologies, and age appropriate novels for the Upper Elementary ELL students. During the Reading class, the students focus on phonics, high frequency words, vocabulary, comprehension, reading strategies, and literary elements. Students practice specific grammar topics through oral and written activities. These grammar topics are also linked to the reading selections and writing assignments as much as possible. In addition, students participate in a Writing Workshop in which they explore English through creative assignments. Students work on constructing sentences, paragraphs, and multi-paragraph works while learning about and implementing the various steps of the Writing Process and the 6 + 1 Traits of Writing. ELLs in Grades 2-6 receive support through Sheltered Science and Social Studies. The ELL teacher works with the students to cover the content and readings from the textbooks. The ELLs and the ELL teacher join the mainstream classes for projects and special activities. Students in grades 7 and 8 go to the ELL classrooms during their grade level English period and their grade level Foreign Language period for specialized instruction in the supportive environment of a small class. The reading program utilizes McDougal Littell grade level anthologies and abridged novels. Students focus on vocabulary, comprehension, reading strategies, literary elements, and literary devices. Students practice specific grammar topics through oral and written activities and the topics are linked when possible to the reading selections. The writing program focuses on developing the student’s ability to apply grammar to writing for specific purposes such as literature response, research reports, or persuasive works. In addition, the students learn about and implement the Writing Process and the 6 + 1 Traits of Writing.